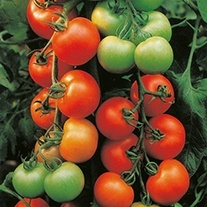 Tomato Seeds delivered direct by D.T.Brown seeds. 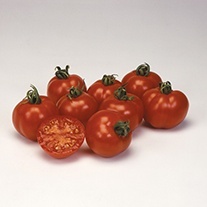 The botanical name of the tomato is Lycopersicon lycopersicum, which translates from the Greek as 'wolf peach', a probable reference to its inferiority to the peach (Prunus persica). 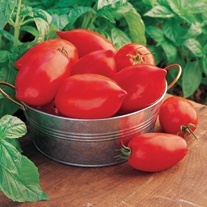 It comes originally from western South America, but it was first cultivated in Mexico and other parts of Central America. 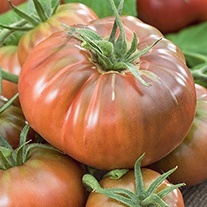 It's likely the name 'tomato' derives from the Aztec 'xitomati', which means 'plump thing with a navel'. It reached Britain in the 1590s, but we are not really sure how it arrived or who brought it. It was mentioned in Gerard's Herbal, which was published in 1597. For centuries it was often believed to be poisonous, a belief which persisted in North America until the 1820s. 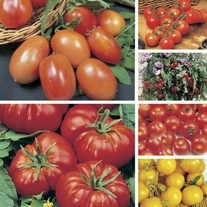 Determinate tomatoes also known as Bush tomatoes. 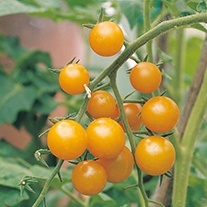 The plants are smaller (up to 90cm/3ft tall) and rather compact, can be grown with or without support. 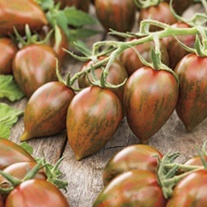 Removing side-shoots from determinate tomatoes is not recommended. 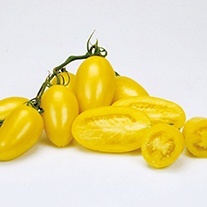 They produce early, one large crop of fruit in a short period of time (2-3 weeks). Almost fill a seed tray with moist seed compost. 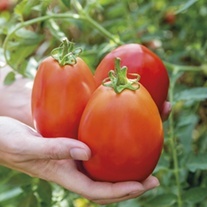 Sow tomato seeds thinly and lightly cover them with a little more compost. Place in warmth 18-20°C/65-70°F, and keep moist. Keep seedlings in a light position, but shade from bright sun. 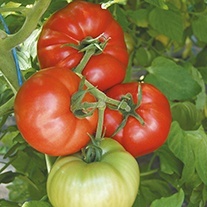 When large enough to handle, transplant them individually to small pots of potting compost, and maintain a minimum 15°C/60°F. 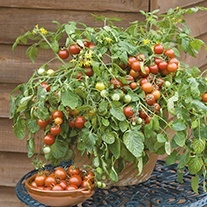 Indoors: When first flowers have opened, transfer to growing bags, large pots or greenhouse border. Outdoors: Gradually accustom plants to outside conditions for 2-3 weeks before planting out when danger of frost has passed. Water plants generously and regularly. 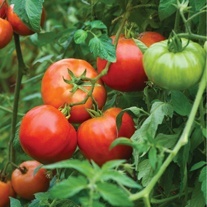 When the first fruits start to swell, feed with a proprietary tomato fertiliser. Support the main stem of each plant with a bamboo cane. 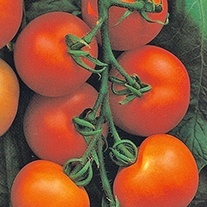 Remove side-shoots as they appear. 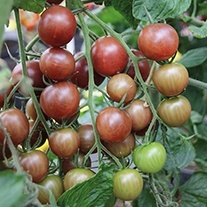 Remove the growing point of each plant once 4 or 5 trusses have formed. 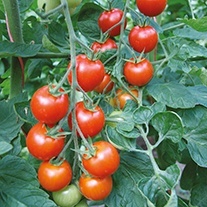 Gradually accustom tomato plants to outside conditions for 2-3 weeks before planting out when danger of frost has passed. Allow 60cm/24in between plants. Water plants generously and regularly. Plants tend to sprawl, so a little straw placed under them will help prevent rain damage.